Motor Max 1979 Chrysler LeBaron Town and Country Wagon. 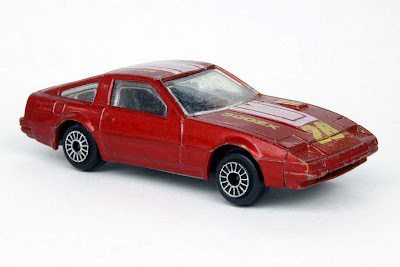 Today's post is about a classic styled car first released in the early 1980's. 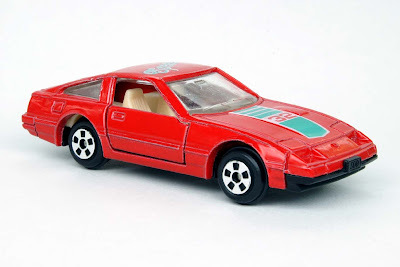 Nissan introduced it's successor to the 280ZX in late 1983, and named it the 300ZX. During the 6 years it was manufactured, it started out from being popular with the public to an out-dated looking vehicle that needed to be retired. 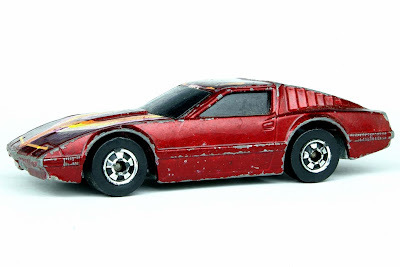 But when it was first introduced with it's angular looks and styling, it caught the public's eye and also the attention of the diecast world. 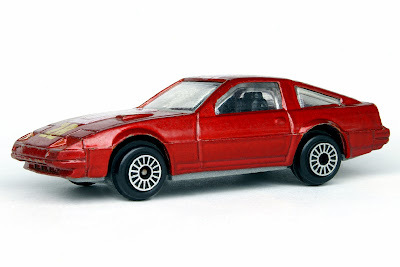 Just about every company that produces 1:64 scale cars produced their own version of the Z-car. 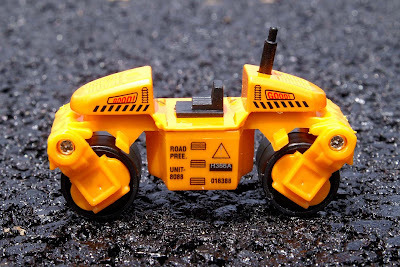 Companies such as Tomica, Siku, Matchbox, Maisto, Ertl, Tootsietoy, Road Champs, Hot Wheels, Majorette, as well as the three highlighted in the picture above, Welly, Yat Ming and Zylmex all had their own version of this venerable classic. I'd like to go into a little more detail with the last three brands. Welly's version, numbered 8380, featured opening doors and an interior with not much real detail. 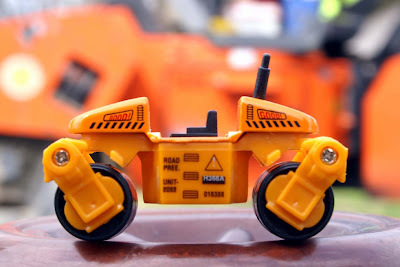 Their version is a copy of the Tomica car, but done in a realistic looking paint scheme. 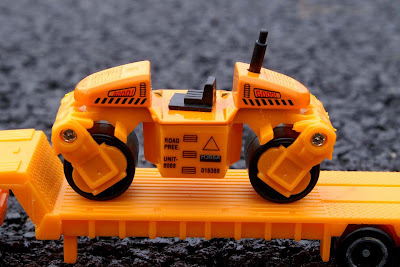 The tires are not too overly big to fit the wheel wells and the base is made out of black plastic. The clear windows show off the interior well. The Yat Ming version, numbered 1027, is a fairly innocuous model, redeemed by realistic paint and graphics. It's doors do not open, but the windows are clear and you can see the interior in all it's detail. 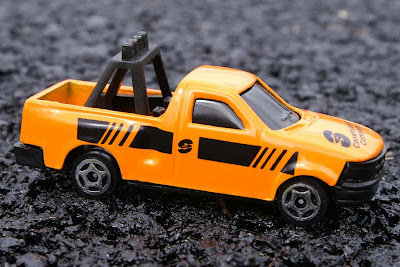 The base on this model is also plastic and the car itself is, overall, a very light-feeling piece. It does have the advantage of having a plastic piece in the back to simulate the rear bumper. 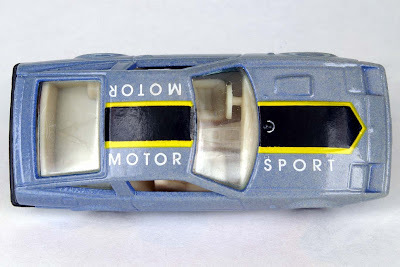 The graphics say "Motor Sport" along the top of the roof and hood. Another very light casting is the model by Zylmex, actually using the company name Zee for this one, numbered D78. The paint is nice, but the graphics seem a little thin and wear off easily. The windows are also clear on this one, but due to the black color of the seats and dark exterior paint, it's harder to make out the details of this interior. The base is gray plastic on this model and the doors do not open. The wheels are a good size and fit into the proportions of the wheel wells quite nicely. All three models sport their companies' typical wheel styles. 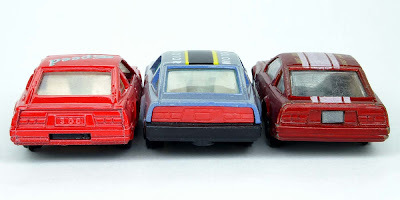 The view of the backs of all three models are similar, but there are differences. The base on the Welly mounts through a hole in the rear bumper instead of being riveted in the back. The Yat Ming has the aforementioned black plastic bumper piece and an insert for the tail light and license plate area in red. The Zee model's base is also mounted through a hole in the rear, simulating the license plate area. The stance of all three cars is pretty similar. 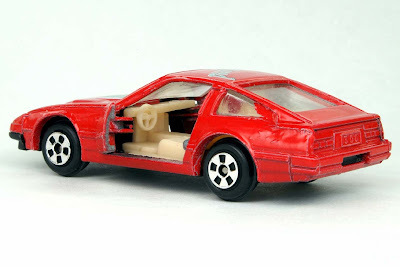 Looking through the open doors of the Welly 300ZX into the interior, you can see that there's not much definition anywhere. But, the opening doors are a nice touch. The graphics along the top of the Yat Ming version are very understated, but nice and realistic. You can see that the interior on this model has much more detail than the Welly, even including the shifter column between the front seats. Two of the three versions simulate the side windows in the down position, this one and the Welly. With it's thick windows and black seats, it's hard to make out much detail on the inside of this one. It's graphics seem gaudy in comparison to the other two, but overall, the car has a nice look to it's lines. 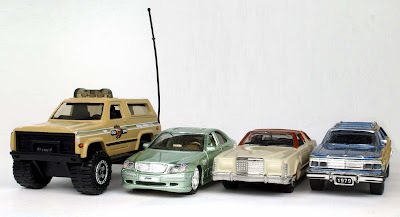 All in all, each of the three models has features that make them realistic in comparison and scale to the life-size models made by Nissan. 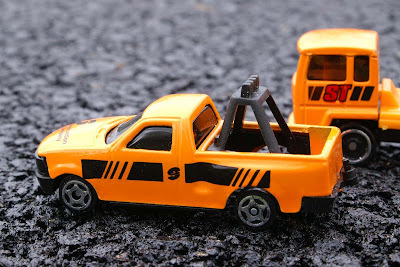 These miniature replicas are all on the light size as far as weight goes, but this is typical for toy cars made in Asia. I have to say that I'm glad they're a part of my collection as they have a nice design, one which is quite appealing to my eyes. 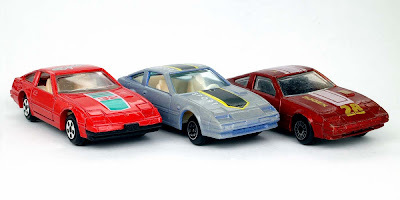 The choice of exterior paint on all three cars seems to be what could have been on the real models and are not too bright or gaudy, nor unrealistic colors. This is another plus for me. One last note before I go. 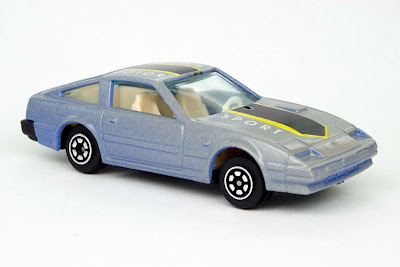 Although Mattel released it's own version of the Nissan 300ZX in 1985, it also released a version in it's Crack-Ups series that same year which featured louvers over the back and side windows, and which has not been released since or in their mainline. It was given the strange name of "Speed Crasher" and featured a rear bumper that rotated when hit to simulate rear-end crash damage. This could be something they might wish to look into somewhere in the future with the thought of updating the casting without the smashed rear bumper; as this is the only version with the louvered windows. They were popular back in the late 1970's and 1980's and I think they look kind of nice. As always, comments are welcomed and appreciated! Until next time! Just a little bonus to the Road Construction post. 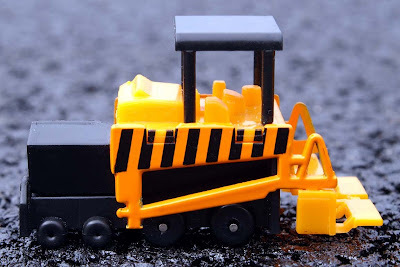 Here is a 1:64 scale steam roller framed with a real-life version of the same piece of heavy equipment in the background. I had to time the shot perfectly to get it. 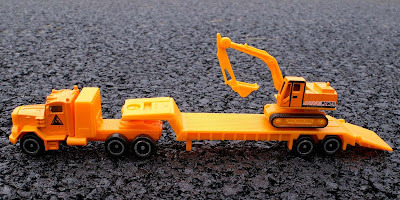 It's another road construction contract, so they truck the heavy equipment they'll need for the project into the site the night before they're due to start the job. And to do that, you'll need to start with a semi truck and a heavy duty flatbed trailer. In case they need to dig up some culvert pipe, they have to have a big digger present. Here they're unloading the excavator. 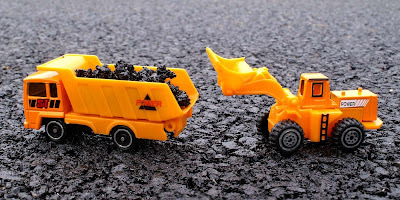 This is the vehicle that will be doing the actual spreading of the asphalt. 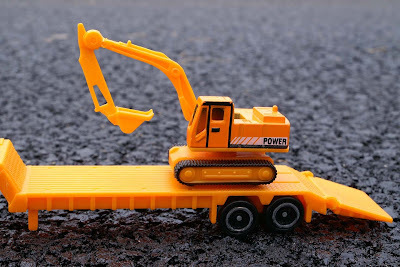 Oddly enough, it's known as an asphalt paver. And of course, you'll need a heavy steam roller or two! The heavy metal machinery is starting to build up. 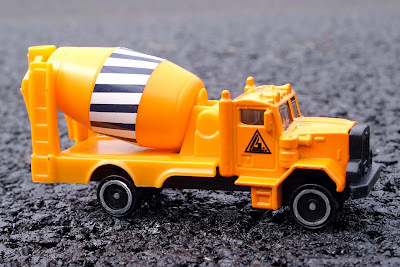 And to pour those shiny white concrete storm drains, a huge cement mixer will come in very handy. This is the bosses' truck. He's always moving around keeping an eye on everything. 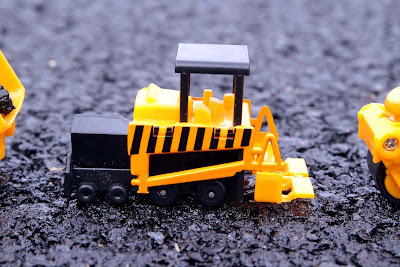 He gives the command to start paving the road! 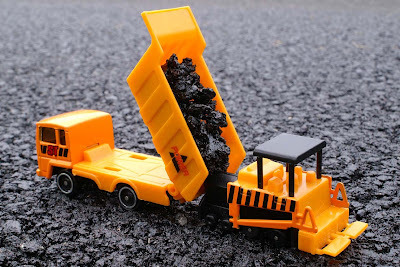 The first load of fresh asphalt arrives and is loaded into the paver. Gotta lift that bed high to get it all out! 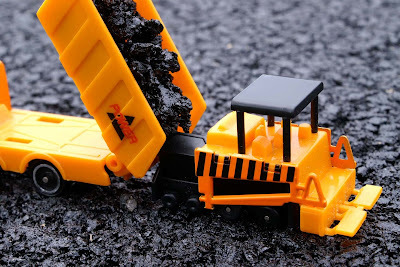 You can see it goes right into the hopper of the asphalt paver. The boss moves around a lot. He has to stay on top of everything and keep the job running smoothly. 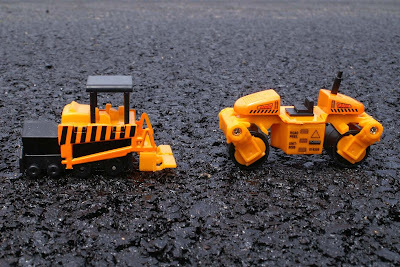 Here is a close-up of the asphalt paver. 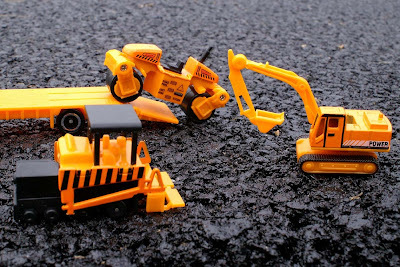 Once the paver goes through, the rollers follow. 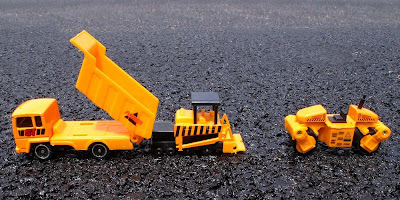 It is these lumbering dinosaurs of the heavy equipment world which smash down the freshly-laid asphalt into a nice, smooth roadway. 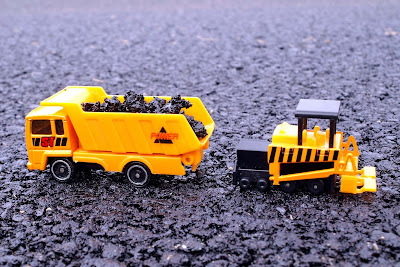 Another load of asphalt is used up. A job such as this uses a lot of it! 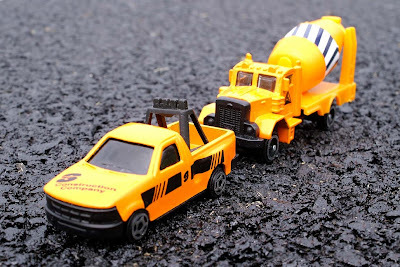 Sometimes, you need a little asphalt to fill in a few areas along the edge of the road. Such as mailbox turnoffs, driveway entrances and side streets. This is where a front loader comes in handy. The crew keeps moving right along until the job's finished. And when the job is done, the boss looks on and says it's time to go to the next job - wherever that may be. 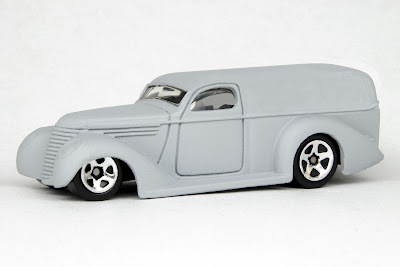 This is a 1939 GMC Panel Truck, by Hot Wheels, in Rat Rod primer. I'm certain that many companies in the waning year of the '30's would have liked to have had a delivery vehicle like this! Another Panel Truck, this one a 1962 Chevrolet. 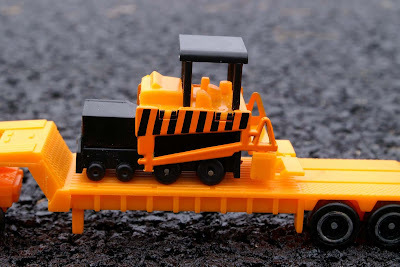 Featuring a down and dirty stance, this is one stylish hauler that will flat haul the mail! In the Fabulous Fifties, Ford introduced this popular little truck called a Ranchero. 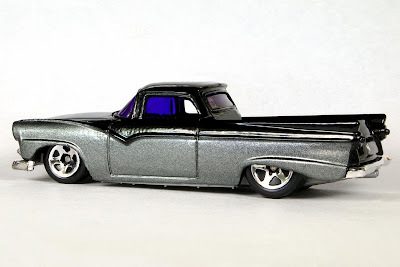 This is the 1955 Ford Ranchero, in black and silver. This is not your Grandfather's old truck! Back in the day, I had two Rancheros from the early 1970's; great vehicles. 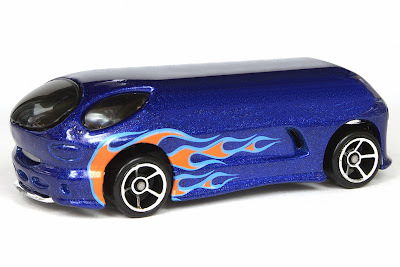 Hot Wheels has always been known for it's own custom creations. This is their popular Deora II in a Panel Van version. The flames make it look fast, even when it's not moving! 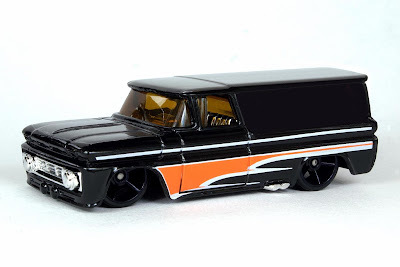 And lastly, one of my favorite body styles - the station wagon. 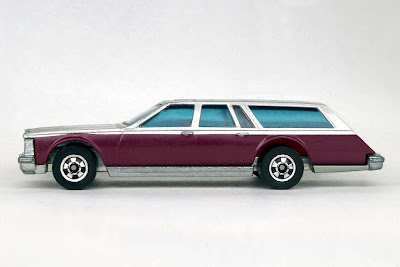 This one is a 1980 Cadillac Seville Estate Wagon. Kind of makes you long for the country, doesn't it? Just so you could own one of these lumbering log wagons. Well, I hope you have enjoyed this look at some of the rare vehicles in my collection. Don't be envious if you've not found any of these for your own collections, after all - it is the First of April!